If you follow me on Facebook (and you should), you have seen some of my tales from the school cafeteria. Those stories have always involved the kids. However, a recent incident makes me think it is time to talk about the parents. There is a mom from my daughters class who had volunteered a couple times in the cafeteria the first couple months of the year. We will call her Smother. Because every time she came to “help” she would just sit down next to her son and help him eat his lunch. Now this boy is in the gifted class. And seven years old. And feeds himself all the other days of the week that she isn’t there. But apparently none of that matters when Smother shows up. In her mind, it is necessary for her to feed him. You know who didn’t think it was necessary? The school security guard who oversees the cafeteria. He had me tell her that if she didn’t actually start being helpful to all kids she would not be welcome back. So guess who never came back? So Smother of course told her son she would bring in cupcakes. Except she went to the fancy bakery, where they don’t do mini cupcakes and the regular ones cost $3 each. And she had no intention of spending $45 on cupcakes for the class. So she brought in just one. And then wanted the kids to all sing to him while he ate it. When the kids complained that it wasn’t very fair, she actually lectured them on how it wasn’t their birthday. Then she left the cafeteria content with her self involved life. I doubt we will see her again. Then there is the father who volunteers. He is the husband of a regular volunteer (who will go by wife moving forward). When he first started volunteering I was so excited that a father was joining the fray. Then a friend of mine, who is also friends with wife, asked me what happened between wife and I the day before. I told her not much. A boy who regularly misbehaves took it to far and I removed him from his table and brought him to the security guard. The security guard had him sit by himself until the teacher came back and they could decide on a punishment. The boy was scared and spent rest of lunch crying. Wife came to me and said the boy was sorry and could he please rejoin the class. I told her it was out of our hands – the security guard set discipline rules when teacher isn’t there. I also told her I agreed with the security guard, and that I felt that the kid needed to be scared so that maybe he would change his behavior moving forward. She tried the “boys will be boys” line with me, which I absolutely hate. I know plenty of incredibly well behaved kids. And they are behaved because their parents don’t make lame excuses for them like “boys will be boys”. Anyway. The kid returns to his class, having eaten very little of his lunch cause for the first part he was to busy misbehaving and the second part he was to busy crying. So now wife comes up to me with her arms full of junk food – chocolate milk, chips, gummies, etc. She tells me that she wants to bring the food to the boys class because he hadn’t eaten lunch. I told her no, that I didn’t think he deserved to be rewarded for his bad behavior by receiving what were essentially treats. Now, I don’t actually have the authority to stop her from doing whatever she wants, but for some reason she thinks I do. Must be that she recognizes I’m a Trophy Wife. 🙂 So she starts trying to justify his actions again, with the whole “he’s a boy” thing. I repeated what I had said before – that he still needs to learn proper behavior, respect for places and people, and how to act decently. I never raise my voice, move a hand, or do anything other then just continue to say that I think he needs to learn consequences for his actions. The conversation ends and I go about my life. And this is what I tell my friend. Who then tells me that wife felt threatened by me and was sure I was going to hit her!!! I keep adding exclamation points because it is so utterly ridiculous to me. !!!!!!!! Then it hits me – is the husband now volunteering to protect his wife from me? Me???!!! I may not get my nails done so I don’t need to worry about breaking one, but I also don’t wear a huge cocktail ring to knock someone out with! The whole thing is absurd to me. It would never occur to me to hit someone. Which is what I tell my friend. And she relays back. And I guess they believe, because wife and husband are both okay with me. Even better, husband has now seen first hand how bad some of these kids are and that sometimes they need to be held accountable. The other day he came to me to complain about how appalling their manners are and how he likes to just stand there and stare at them until they say please and thank you to him. Right on, husband. And that is todays tales from the cafeteria. But since I am there often I am sure there will be more (again, follow on Facebook if you want to see them). I was there yesterday plus there was Hebrew School and cookie delivery in the evening. So no time for real cooking. Crock pot! I found a recipe for Quinoa Chicken Chile on Cook Like A Champion that looked intriguing and I had most of the ingredients, so that is what I made. I did of course have to make a few changes. 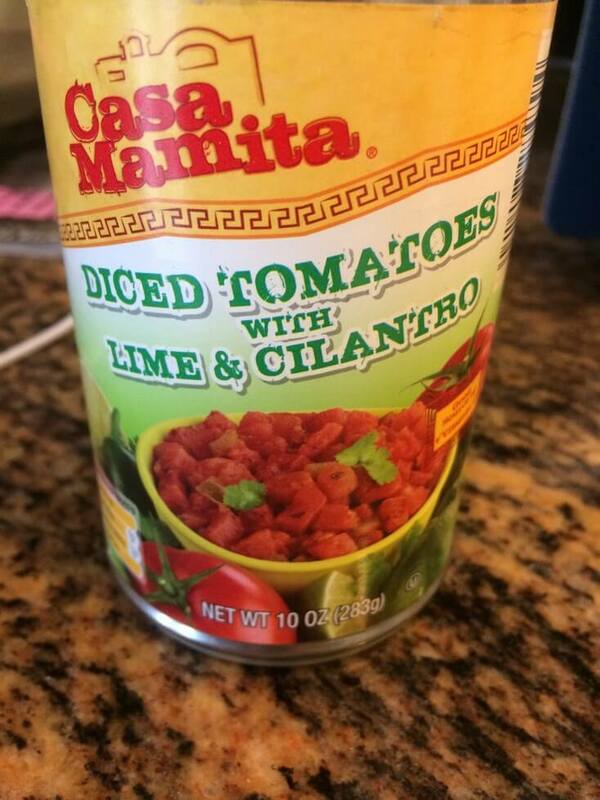 The original recipe called for 28 oz crushed tomatoes and 14 oz tomatoes with green chiles. Now, I actually had all that. 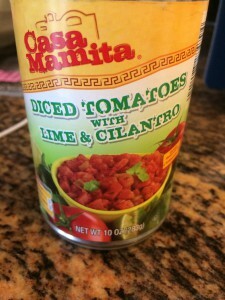 But I also had an 11 oz can of tomatoes with lime and cilantro (doesn’t that sound awesome?) that I really wanted to use. So I decided to use three different types of tomatoes to get as much flavor in there as possible. So my last 14 oz can of tomatoes was fire roasted diced tomatoes. Now, I couldn’t actually taste any of these distinct flavors in the end result, but they did meld together into a great flavor profile. The other changes I made were a combo of personal preferences (no onions or jalapeños due to child and no corn cause honestly, it just seemed weird to me) and laziness (I didn’t think the step of heating the remaining veggies was necessary. Either the veggies would get soft from 9 hours in crock pot or the chile would have a bit of crunch to it, which would add a nice, different texture to the chile.) 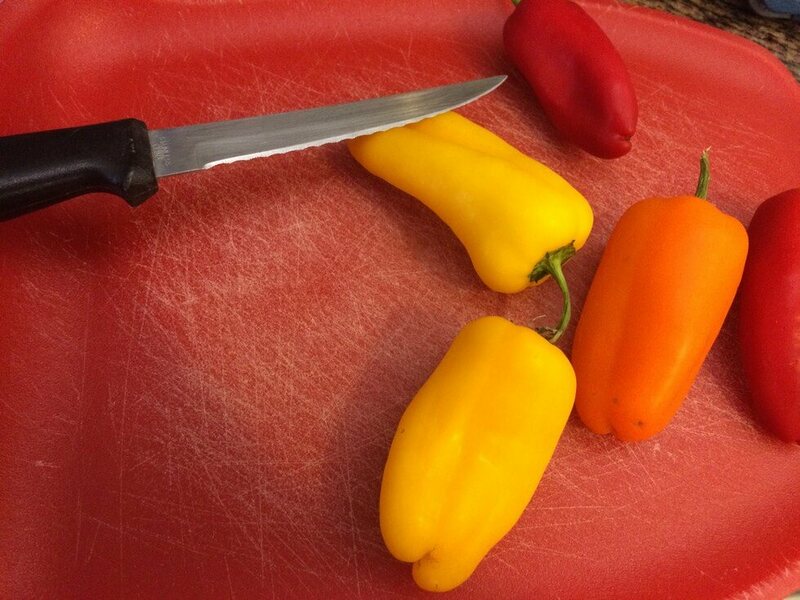 I also used mini peppers instead of one large one, because that is what I had. I also added my chicken completely frozen as I had decided on the recipe at the last minute. And again, 9 hours in crock pot. I knew it was fine. The end result was great! Quinoa made in flavored liquids instead of just water always taste incredible. Its as a little more soupy than I would have preferred, but my husband said he loved it that it way. If you don’t, use 2 1/2 cups of chicken broth instead of 3. Otherwise, enjoy! Add first 10 ingredients (quinoa thru salt) to crock pot. Combine well. Place chicken on top. Cook on low for 6-8 hours. 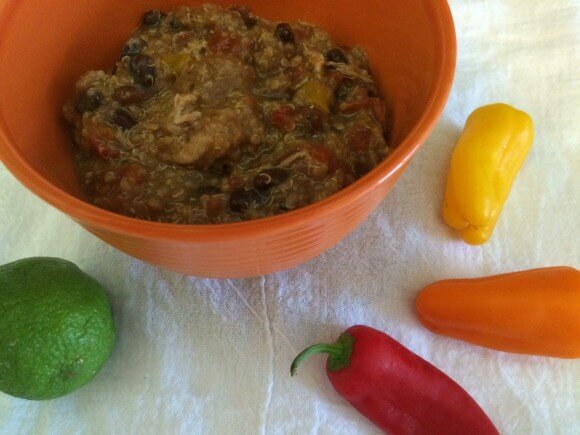 Shred chicken into chile. Serve with garnishes and enjoy!